The absence of witnesses from the stand may have a technological twist. As part of the amendment, there is also a provision to establish a video link through which witnesses may testify. But before there is a trial, there has to be an accused charged with a crime. The administration intends to widen the scope of time that the cops can withhold a suspect for questioning. Forty-eight hours has often been the allotted time before that person of interest is released. But the constitutional amendment also establishes the possibility of detention up to twenty-one days. It’s a controversial amendment that is bound to have anyone who is locked up in the police holding cell crying foul. And according to Barrow, an application to the Supreme Court should also be able to extend that twenty- one days without charges. The preventative detention amendment was first proposed back on April twenty-fifth, 2008 but then withdrawn a month later due to public outcry. Now that it’s back on the table, aspects of the bill have been further modified. Barrow is sailing into very very dangerous waters. 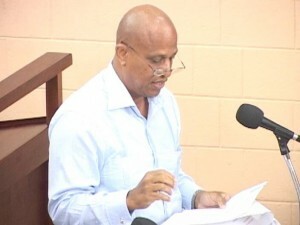 A very sad state of affairs in Belize, PM Barrow is insisting that he is convince that the only solution to the crime situation in the jewel is to take these extreme measures, draconian laws, suspending the constitutional rights of citizens of the jewel in an attempt to prevent opposition to his incompetent administration. Why take these extreme measures when the gob has demonstrated inability, unwillingness, in short no cohones to enforce/follow the laws as they currently exist. Clearly, this crazy bald head is up to no good. We need to chase him out of the land, his behavior certainly resembles that of Assad of Syria, Qaddafi of Libya and some of the evil tyrants of the middle east. Quite recently, when one of his cronies was arrested, the dpp personally showed up in court to ensure that the laws of the land would not be adhered to, claiming that the individual could not be accommodated in prison because of diabetes. A few days ago in the news it was reported that a very sick young man was in court for stealing $20.00 in order to pay for his treatment for diabetes, unfortunately this young man was fined and threaten with jail time if he could not pay the fine, now the irony of this, is if he had to steal $20.00 for his treatment, how in the name of justice will he pay a fine of $500.00, Now-then, this is only one of the many examples of the miscarriage of justice in the jewel perpetuated against poverty stricken nameless, faceless individuals. Different strokes for different folks, imagine the possibilities when these draconian laws will be in place/enacted. Rise up Belizeans, stand up for your rights. Rally around this issue of tampering with your rights in the name of prevention intervention. Now is the time for all men to come to the aid of their country. sounds like we can hold the average normal small criminal mind of small cases for 21 days under suspicion and also extensions can be put to it. I think this should not be done. How long does it take to get evidence on a person, i think this law could be abused greatly by the police. The 21 day detention may be a good thing, but we must be careful with its implementation. PM has said that anyone that challenge must be a fool because of the situation in the country. I cannot agree with that and I believe that all should oppose this part of the amendment. We are looking at the episode of “innocent killing” in our country as a means to provide social cohesion, to provide an enemy image to keep us together. Our entire social order, political parties, are intellectuals, are challenged with a method for eradiction, that could have been instigated by party politics. Be careful Belize, this technique could be used by the ruling government to gender or manipulate public opinion in order to further its own agenda. This change has been implemented by other countries in the name of eradication of a threat to society, however it could be the begining of a strategy for relieving us of our basic freedom. Sound’s outright communist,we the belizean people should have reasonable constitutional right’s,unless that person pose imminent threat,or danger to public safety,once again let’s not throw out the baby with the bathwater. The police will not pick up the REAL KILLERS (they are on their payroll) —- the police will pick up people they have personal grief with,,, lock them down & go mingle with their lady. Marshal Law the PM have for the people them………. so 21 days hold up. at whos expense tax payers expense period…. Hi am 32 and i just had triplets 1year ago i have lots of fun with them but what i really need is help is with diapers and clothing if you could help me my phone number is 619453-8598 they are 3 boys thank you.